I have two early artifacts (see above) showing images of unidentified women library workers. The first is a photograph of ten women and one man. There is no clue as to which library they work in. The second artifact is a Real Photograph Postcard which shows seven women. The postcard was mailed on July 10, 1907 from Aurora, Illinois to Newkirk, Oklahoma. There's a good bet that the library in the postcard is located in Illinois. Perhaps the University of Illinois Library. Both images are evidence of the feminization of the library profession in the United States. There were hardly any library workers in U.S. libraries in the mid-19th century. Barbara A. Mitchell in a chapter titled "Boston Library Catalogues, 1850-1875" in the book Institutions of Reading: The Social Life of Libraries in the United States (Univ. of Massachusetts Press, 2007) relates the hiring of women to create catalogues by Boston area libraries. The Boston Public Library was the first to hire women for this purpose in 1853. The initial salary for these women was $4 per week. In the first national library conference in 1853 there were eighty-two men present and no women. When the 1876 conference of librarians that resulted in the formation of the American Library Association took place in Philadelphia thirteen women were among the 103 attendees. In the next four decades major advances in the role that women played in library services took place. 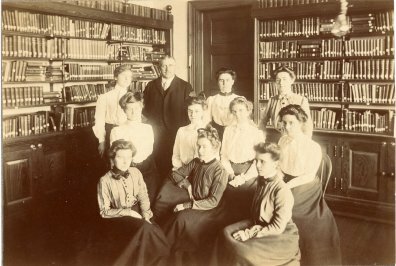 One significant aspect of these advances was the involvement of women in library education starting with the library school created at Columbia University by Melvil Dewey in 1887. Dewey later moved the school to Albany, NY when he became New York State Librarian. One of the first graduates of that school, Katharine Sharp, established a similar school at the Armour Institute in Chicago in 1893. That school moved to the University of Illinois in 1897 where Sharp became director of both the library and the library school. Because of health reasons she left Illinois in 1907, the same year as the postcard above was mailed. I don't think Sharp is one of the women in the postcard, but I can't be sure. Any help with identifying the libraries in which the photographs were taken will be appreciated. Update: The women in the photograph on the postcard mailed from Aurora, IL have now been identified. See my post for July 25. Do you have a higher resolution image? That would certainly help. That said, I am fairly certain that the second image is indeed the University of Illinois at Urbana-Champaign. That area has certainly changed since then but it looks like the Main Circ desk in front of the stacks before thy were pushed back some and greatly expanded a few different times.. Per a facebook recommendation from Mark, I'm bringing my observation here. I spent most of my undergraduate in Altgeld Hall at the University of Illinois. This looks suspiciously like the Math Library's main circulation area. I haven't set foot in the building since 1998, so this could be horribly inaccurate. 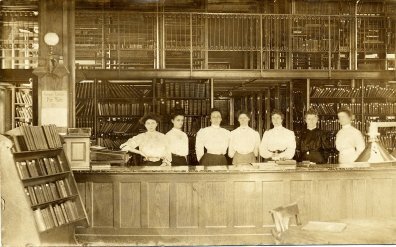 Hmm... here's a photo of what looks like the Altgeld circ desk, circa 1900. This looks more curved than the one in this picture (and I don't see the stacks in the background). It's a little hard to see the faces in this low rez image, so can't tell if that's early faculty or not. We are pretty sure this is the Aurora Public Library (Illinois) main floor circulation desk and mezzanine area - still in use today! Checking our archives to see if the ladies can be identified. Auror Public Library in IL has confirmed that this photo is of our Main Library circulation desk. We have the photo in our archives. It was taken in 1908 and the names listed on the back are, left to right: Alice Belleau, Gladys V. Hull, Minnie J. Pooley, Matie K. Quinn, Lillian C. Miles, Kate E. Marshall, and H. Belva Hull. From reading Library Board minutes, it appears that the 1907 and 1908 date assigned to the photograph is probably wrong. The minutes for March 16, 1909 (page 418) include a request from James Shaw about the recently acquired German language collection, and the need to print a catalogue of titles. In the picture, there is a sign on the right advertising such catalogs for sale, so the true date of the photograph would be at some point later than March 1909.